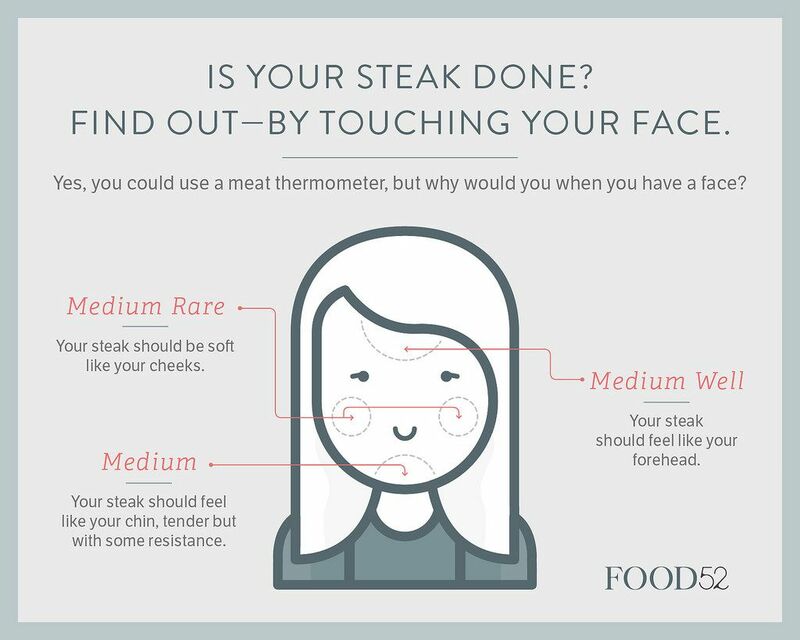 Today: Your face is only tool you need to tell if your steak is done. There are more than a couple ways to check if your steak is done. Many people will tell you to stick an instant-read thermometer into your steak to see if it's done. But sometimes, you just can't find your thermometer—or you don't have one. Others may tell you to use the palm method, in which you compare the feeling of your steak with the meaty part of your palm when your thumb is touching various fingers (index being rare to pinky being well done). But I find it a bit difficult to tell the difference in palm fleshiness, and I'd rather use one hand to touch the steak for an accurate comparison. If you'd like your steak medium-rare, it should feel like your cheek: tender and soft but still fleshy (as opposed to raw, which would be just soft). If you want a medium steak, touch your chin: The steak should still be tender, but with some resistance. For a medium-well steak, it should feel like your forehead: fleshy but with a good deal of resistance. We hope you'll be spending lots of time in front of the grill in the coming months—ideally, poking your face. Your guests may presume it's an odd party trick, but they'll think otherwise when you bring them a very well-cooked steak. Tell us: Besides steak, what else are you grilling this season? Type 'Reverse Sear' into your search engine . I never cook a Steak using the Sear Sear Method anymore . Reverse Sear gets my Medium Rare from edge to edge , and juicy too . Everyone I've told wouldn't go back !! I think the point is missed. It didn't say touch your face every time. The reference is the softness of touch of your cheek, the firmness of your forehead. I like to use the thumb to fingers method to check doneness. Like others have said it's you preference on how you cook your steak. It's not a right or wrong. Slow your roll, Chris Burke as Corky. Nowhere in the article does it say not to wash your hands. Nowhere in the article does it say touch your steak and your face on the same day. Nowhere in the article does it say to use the same hand for the steak and your face. You must be a delight at dinner parties. This is UNSAT and Unsanitary. BOTH Board of Health and HACCP require you to wash after touching your face. To touch your face then touch anything else risks cross contamination and YES your face IS that dirty. I agree there is definitely NO compromise when the issue is food safety and sanitation. I get my grill hot - put the steak on for about two minutes per side, and call it dinner. No thermomoeter needed, not comparisons to my own body parts. If you want to make one perfect wall-to-wall medium rare for your pal, and one perfect medium for your other pal, you simply cannot go two minutes per side and call it good. The heat, the thickness, direct vs indirect- this all matters. For your tastes and from practice you could do that for your steak, but a good instant-read thermometer is a tool worth investing in for most people. Really, Food52??? I loves ya, and you have some of the loveliest recipes, but sometimes you do come out with some doozers. This would be one of those times. Get a good meat thermometer - Thermapen can be found inexpensively at ebay UK , for instance, and stop poking your face. You won't be removing the steak from the very hot grill with your bare hands. You wanna learn how to cook a steak correctly don't poke your hand or your chin, poke around at Amazing Ribs dot com. There is good information. Here is proof the Internet is full of misinformation and silliness. Not everyone knows how to cook. Let alone a steak. Why is it wrong for this site to post their opinion but okay for everyone else to post theirs? Some recipes I choose to incorporate into my repertoire, some I don't. Same as cooking techniques. Thanks for being a great resource Food52. It's not wrong. And it's not an opinion. The problem is that what they recommend here is unsanitary and any health department in the country would say so. A reminder that we welcome constructive feedback and dialogue on Food52, but some of the conversation in this thread is not in keeping with that. We'll be removing any comments that violate our Terms. Cook your steak however you like to, and try this method for if you're lacking a thermometer—or just for fun! Here's to rooms of people poking at their faces, like we've been doing at Food52. What a load of crap this is! The only way of measuring how your meat is doing is a good fast read thermometer! I personally recommend Thermoworks! It has changed my way of grilling as well as bread making forever. Only thing I can think is that this guy was recruited from commercials, like "Chef Tony." from infomercials on early a.m. TV! Dude..you clearly haven't been cooking for very long. I've done the "touch method" forever and my steaks are killer. Even Ramsey uses this method. Only load of crap is the one coming from your mouth, my darling. I gave up touching for accuracy about 40 years ago. Gordon Ramsey yells at people to encourage them... For most, that doesn't work either. I'll say it out loud! What a crock of BS! Once again someone who has decided to hand a new rule while making assumptions. Who comes up with this dung? I used to love this site but since you incorperated the shopping portion the cooking articles the site isn't worth opening the emails. This article broke the camel's back for me. Ali trying to defend the ridiculous premise reads like a preteen girl. My forehead as medium well, sorry but my forehead would be jerky. And not good jerky. There is a reason for the palm method. Even when due to illness and one is skeletal thin, the palm and fingers still have some flesh. If they didn't the story of Hansel and Gretel wouldn't exist. Yep this article did it for me. CYA! They need a like button, so consider your comment liked. Unless you have some serious bugs on your finger, your worry isn't about being unsanitary. It mentions poke your face with one hand, the steak with the other. The surface of your steak is hot enough (to burn you) and to kills bugs within two seconds. Most would wash their hands before touching their food anyway, right? Incorrect. Every health department in the country has reg's that say you must wash your hands after touching your face. And no, the steak is not hot enough to kill the germs on your hand. If you sear the steak, it is. You grab hot dogs and apples with bare hands and eat them. You poke your steak, and that's unsanitary? Your arguments are silly. My arguments are based on science and more than 3 decades in the foodservice industry, What you got? Nice try. At what temp are these sperbugs on your fingers killed by heat? The microbes in hamburger are killed at 160F, no?. I suppose the surface of a steak on a hot grill remains in the range of 40-140F order for these bugs to proliferate? Now what you got? (A) After touching bare human body parts other than clean hands and clean, exposed portions of arms;"
Hmmm, why do you suppose that is? I don't want a chef touching their face and then my steak either. If a chef were to need to do this, he/she should not be a chef. But, this is hardly my point. And you're quite sarcastic for a professional, wouldn't you say? I want you to refute my science. A steak on a, say, 300* grill, has a surface temp at or approaching 300. Tell me what bug will live in that? Touching your steak will no more harm you than touching the apple you're eating. Of note is that you are crossing food sanitary regulations for a professional foodservice kitchen with the backyard grillmaster, which is whom this article is speaking to. MY point is that it won't be "unsanitary", which by definition means: "unhealthy or unhealthful; tending to harbor or spread disease". Hardly the case in this context. Now, that said, do I agree you should touch your steak to tell its doneness? No way! Silly! But is it unsafe or unsanitary? Hardly. If you touch any surface that is 300 degrees you will burn your finger. 150f for 2 seconds is sufficient to produce minor burns. The surface that is face down on the grill is 300. When you turn it, the top surface cools rapidly. Also, presumably, when you are cooking a steak on a backyard grill, you are doing so for more than just yourself. It's a simple matter of best practices. Besides, as so many others have noted here, a thermometer is both more sanitary and more accurate. I agree with the majority of this comment. Best practices, yes. Thermometers, absolutely yes! Touching your face, no. But...you claimed in your first comment that I'm "incorrect". You haven't proven how that is true, or was that just a knee-jerk reaction because you presumed I was just another uneducated schlub? We can agree that this article is whimsy, that it's certainly not best practice, but for kicks and grins and parlor tricks you could poke your face if you absolutely insisted and it will not be unsanitary if you cook your steak on a hot grill, especially if you wash your hands first, and as the article says- touch your face with one hand, the steak with the other. Otherwise, cut it open and peek or wing it. It will take about 30 seconds for the upward surface of the steak to dive to below 150f after being turned to that upward position. Thus germs can and will survive upon it. Your hands have presumably touched at least the tongs to are using, not to mention the handle on the grill cover, your beer, and the hand you shook of the guy who just arrived at your party. Cross-contamination is sneaky. Not worth the risk. Thank goodness we all have an immune system. I for one reverse sear my steaks, they get a sear on both sides before plating. Great practice. Totally agree, on all counts. Chefs, who cook the same repeatable pieces of meat numerous times daily, can get it right without thermometers, for the rest of the world, get a good digital thermometer and never over- or undercook a steak again! This is such nonsense I cannot believe you are recommending this on a reputable food blog. By suggesting using your face,you are introducing a variable that is not reliable as all our faces are different. Not to mention,all our fingers are different and some firmer or softer than others. You also mentioned that poking the steak with a thermometer causes it to leak juices and dry out meat. That is false and has been debunked many times. Before posting,it would be appreciated by all readers if you would kindly read up on the topic and your suggestions prior to submission. You are just spreading poor kitchen habits. Especially when your suggestions have been debunked. Surely a thermometer is a very useful tool and accurate way to check the doneness of steak. Sometimes, though, a thermometer isn't available (such as if you forget it when barbecuing anywhere that isn’t your house, like at a park or campsite). In this case, someone might use the slice-and-peek method, which the article you link to highly dissuades. My hope with this post is to provide a simple way for people to test their steak and to use their senses to intuitively know when their food is done. You can’t equate your chin to exactly 140° F or your forehead to 160° F, but you can tell the doneness of your steak enough to get a steak you will like. But you're not merely suggesting this as a substitute in a pinch in the article itself as you do in this comment, you actively discourage the use of a thermometer and imply this is a better method. That's the troubling part. It's really no use, Ali..you're dealing with some serious snobs in these comments. I've heard this methos suggested by top Michelin Star chefs and have relied on this method myself for years. I love how some of the comments suggest uncleanliness or improper food handling....like someone would actually touch their face then their food! LMAO. Rookie comments, for sure. Chef Gordon Ramsay himself refers to a quite similar method often during his more intimate online cooking videos. Gimme a freekin break. The article stresses thermometers as a very valid means, but then states that if they're unavailable, use your face. Not saying i agree with using your face either, but it doesn't dissuade you from thermometers.